At Fell Dyke Primary School we teach your children phonics. Our approach to learning phonics in Nursery, Reception, Year 1 and Year 2 is through using Letters and Sounds. We also follow a kinaesthetic approach in Nursery and Reception where children are given an action to help them learn each different sound. This is an effective and interactive way for young learners to recall phonemes. Carefully planned teaching sessions delivered in small groups that are appropriate to the age and ability of the child and follow the school’s programme of study linked to the requirements of the new national curriculum. A range of interactive adult- supported activities that allow children to revisit and review past learning and practise and apply new teaching. Stimulating resources within the learning environment that allow children to apply their phonic knowledge within their child-initiated play. Independent and guided reading and writing activities across the curriculum. Targeted intervention for those pupils who are working below age related expectations and further discrete teaching for pupils within Key Stage Two. In order to ensure that these learning opportunities meet the needs of the children, pupils are assessed individually in phonics and their progress tracked each half term. Parents are informed of their child’s progress regularly using home-school reading diaries and during parent teacher consultations. In the Summer term of Year 1. All children in Year 1 are involved in the National Phonics Screening Check. We will be able to administer the check during the week of the 13th to 17th June 2016. If a child is absent during that week, the school can administer the check up until Friday 24th June 2016. The assessment will be age-appropriate, with children sitting with a teacher and reading one-to-one. It should be an enjoyable activity for children which will take no more than 15 minutes. 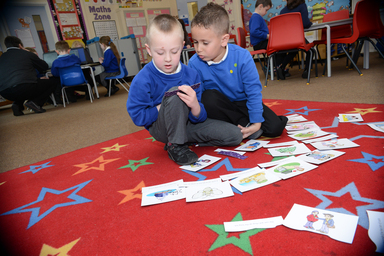 The screening check will identify children who have phonic decoding skills below the level expected for the end of Year 1 and who therefore need extra help. We will then provide extra help at the end of Year 1 and in Year 2 and children will then be able to re-take the assessment in Year 2. Use phonics play phonicsplay.co.uk. This is a website which is packed with interactive phonics games to help children to learn to hear sounds and blend sounds. We use this in school and some aspects of it are free to use at home. Remember! We are here to help your child to do their very best and develop a fluency and love of reading!